Martin Luther King Day of Service - Help us, help others. 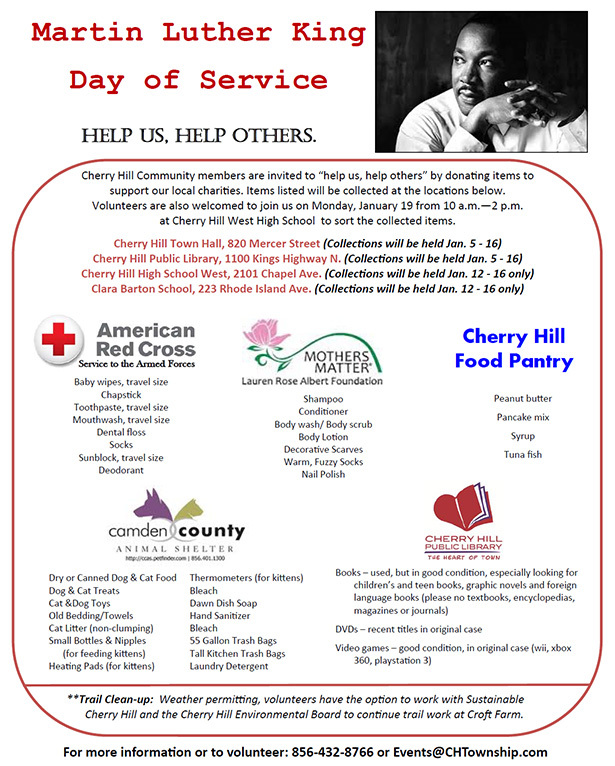 Cherry Hill Community members are invited to "help us, help others" by donating items to support our local charities. Items listed will be collected at the locations below. Volunteers are also welcomed to join us on Monday, January 19 from 10 a.m. - 2 p.m. at Cherry Hill West High School to sort the collected items. **Trail clean-up: Weather permitting, volunteers have the option to work with Sustainable Cherry Hill and the Cherry Hill Environmental Board to continue trail work at Croft Farm. Martin Luther King Day of Service. Help us, help others by donating items to support local charities. Collection ends 1/16. For info: 856-488-7868.